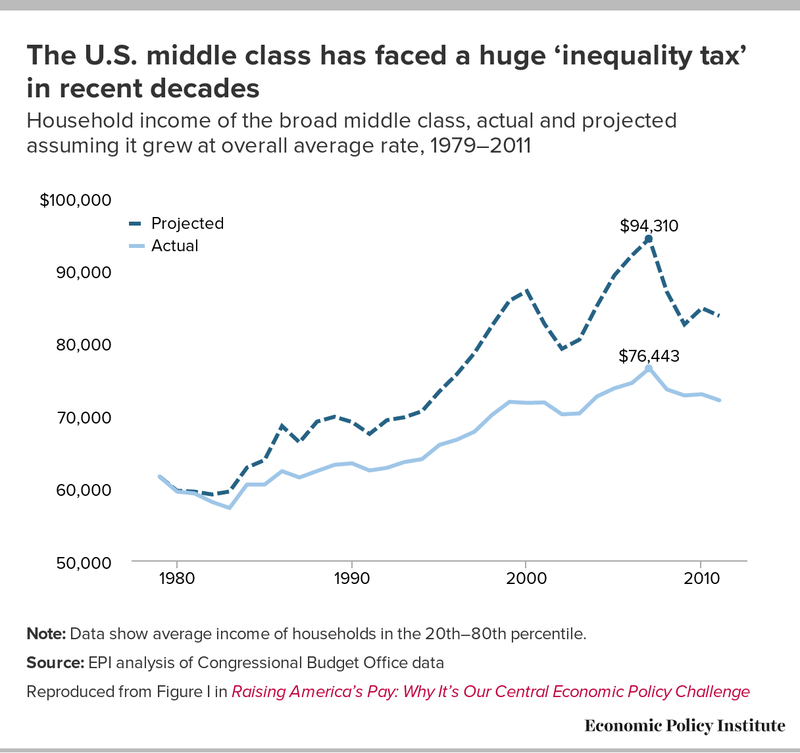 In 2014, rising income inequality became a front-burner political issue, as policymakers and the general public became more aware of the enormous stakes for the American middle-class. The figure below shows actual income growth for the middle 60 percent of U.S. households since 1979 and what this growth would have been had it simply matched the growth of average income, which was buoyed by stratospheric growth at the top of the income ladder. It’s important to note that it is clearly possible for all households to see income growth approaching the overall average rate—this is what occurred for decades following the end of World War II. Note: Data show average income of households in the 20th–80th percentile. By 2007, the last year before the Great Recession, incomes for the middle 60 percent of U.S. households would have been roughly 23 percent (nearly $18,000) higher had inequality not widened (meaning that growth for the middle 60 percent simply matched overall average growth). The wedge between these incomes is essentially a tax on middle-class incomes imposed by rising inequality. Top incomes (driven largely by stock market movements) fell sharply during and immediately after the Great Recession, temporarily reducing this wedge between average growth and growth for the broad middle class. The income data ends in 2011—but the stock market has recovered strongly since then, so one imagines that the inequality tax has surely risen in recent years as well. By contrast, the broad middle class has yet to meaningfully benefit from economic growth since the Great Recession ended, mainly due to stagnant wages.